ABSTRACT: Despite the fact that the number of publications on the morphologic terms of ostracod carapace features is impressive, definitions, use and interpretation of many terms remain inconsistent and therefore fraught with problems. A particular problem is the application of certain terms of morphologic features in different ostracod groups without the consideration of their potentially different origin, genesis and nature. 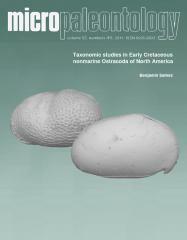 This revised and annotated glossary focuses on nonmarine ostracods, families Timiriaseviinae (Cytheroidea, Limnocytheridae) and Cyprideidae (extinct, Cypridoidea), particularly on the extinct genera Theriosynoecum and Cypridea in its selection of terms and given examples, and is strongly connected with the preceding papers of this issue (Sames 2011a, b) which also include the supporting illustrations. It as well comprises detailed discussions on the origin and differentiation of the taxonomic or otherwise significance of selected carapace features, particularly ornamentation. Herein, ornamentation is subdivided into area-wide and local ornamentation elements for that reason. In contrast to their patterns of distribution, the presence of local ornamentation elements as well as their degree of expression are considered of no, or rather low, taxonomic significance. If applicable, local ornamentation elements can be used for paleoenvironmental interpretations or to identify juveniles in some cases (e.g. in Cypridea). Type, occurrence and shape of area-wide ornamentation elements are, by contrast, always taxonomically relevant to a certain degree. As to the Family Cyprideidae, the alveolar ridge is newly introduced and defined, and the terms for the anteroventral (alveolus and its elements) and posteroventral regions (cyathus, cyathus-like protrusion) are redefined and discussed. A morphologic term can never be a matter of common or collective knowledge as long as its appreciation and usage differs between researchers. In fact, the accuracy of its usage can only be identified when we know that we are talking about the same thing. With this glossary it is intended to better communicate the views of the author, to integrate new insights into ostracod paleobiology into the interpretation of carapace features, and to propose a kind of harmonization between different concepts as well as to put these up for discussion and further development.